Houzz 20 of our visitors have told a friend about this plan. 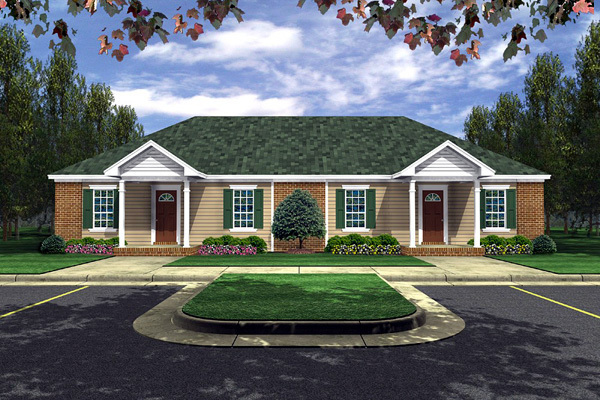 A full-featured duplex plan that is both simple and cost-effective to build. This plan provides an excellent value in space planning, and includes several key features that help to minimize the overall cost-to-build, including the shape of the building, hip roof, and 8 ft. ceiling heights. 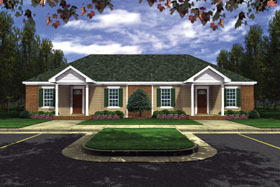 Other unique features of this home design include: highly-effective use of space for 825 square feet (2 bedrooms, 2 baths); large master suite with full bath and walk-in closet, plenty of built-ins, patio for grilling, covered front porch, and great street appeal. A winner for both builders and owners! Answer: Hello, The heated and cooled portion of the duplex is 27'-6" by 60' wide, plus an 8' wide by 6' deep front porch, which totals 33'-6" depth by 60-0' width as listed on the website data. The Patio is listed as "optional" and is NOT included in the overall size of 33'-6"x60'. The patio is just an optional slab, no roof. Thanks.